162 Kings of Northumbria. 3 Ae styca's. 2 Wigmund, Spinks 870. 1 Redwulf, Spinks 867. Various grades. GF-NVF. 164 Kings of Northumbria. Aethelred II second reign. Ae styca. C, 843-850. Moneyer EARDWVLF. Spinks 868. Good metal for issue. GVF. 163 Kings of Northumbria. Aethelred II first reign. Ae styca. C, 841-844. Moneyer FORDRED. Spinks 865. Dark patina. NVF. 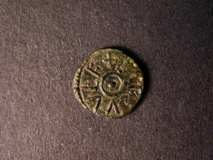 679 Styca Eanred North 186 Moneyer Fordred V.F. 680 Styca Redwulf North 189. 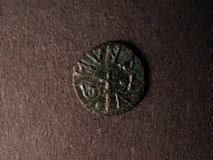 Moneyer Fordred N.V.F.